The face of the franchise is back in the fold, albeit in a different role. After two years away from the game, former Avalanche captain Joe Sakic has returned to the National Hockey League. 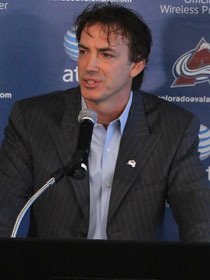 The only difference being that this time around, Sakic will be wearing a suit instead of a No. 19 sweater as he moves into Colorado’s front office. On his first official day on the job, Sakic met with members of the media to talk about his transition into a management role. Sakic’s official title, as announced on March 25, is Executive Advisor/Alternate Governor for the Avalanche. In that role, he’ll be involved in all facets of hockey operations while also representing the club at the Board of Governors Meetings. He already has some experience in the latter department after attending the December meetings in Florida, and that small taste of the business side whet his appetite for more. At that gathering, he was also able to speak with several other former players who have moved into executive roles - including Steve Yzerman, Joe Nieuwendyk, Luc Robitaille and Cam Neel - and gauge how their transitions into the business side of the game went. Sakic enjoyed his two years away from the game immensely. It gave him a chance to spend considerable time with his family, volunteer as a youth hockey coach for his sons’ teams and do some traveling that he had been putting off. Still, the 41 year old had made it no secret that he would be interested in a possible management role at some point when the time felt right. Sakic’s itch to get back into the game truly began during a trip to Vancouver. Now, he’ll will try to bring that competitive fire to the front office. Although Colorado is coming off a tough season that saw the team finish 29th overall in the NHL standings, the former captain sees plenty of reasons for optimism in the Mile High City. While Sakic readily admits he has a lot to learn about the business side of hockey, he’s eager to get started. He’ll spend some time working hard to learn the ropes, and he’ll have plenty of knowledgeable people to help him along the way. At the same time, the other members of Colorado’s front office are just as excited to have such a valuable resource at their disposal.